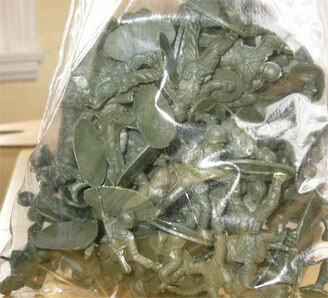 Here's my bag o' soldiers that I obtained at the local 99 cent store! 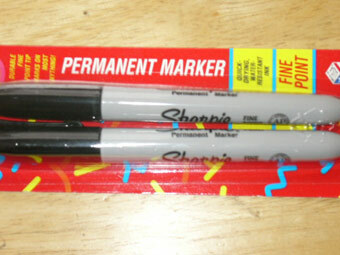 And here's my sharpies for which to write messages! And here's my soldiers lined up, waiting for action! I missed what we are supposed to write on the soldiers. I remember that a guy in Texas or another state, was pasting a label to the soldiers and leaving them all over the place. You can count us in for the Kommandos Project as long as I can leave one at Kingston Aikido. Lizzy, there is a post a little further down about what you might want to write. I've used things like "Bring Us Home!" and "No War With Iran!" Also, would you like an invite? They sure do! They make my dog nervous when they point at her. Lizzy, you have to stick labels on 'em. I didn't picture my labels... an oversight, I guess! All right, Helen! I'm getting mine tomorrow. My kids all want to help. This will be fun. Alicia, what was weirdly cool was that this particular bag o' soldiers was all alone, and on a rack with other bags of things that were definitely not in the soldier category, and I didn't find any other soldiers! And it was on the front of the rack, just waiting for me. I think that's a good omen for our project! Or maybe these particular soldiers were getting bored just hanging around doing nothing. What a work ethic! I'm buying my soldiers today; getting my labels; sharpies. My camera has arrived, I have a memory card (just need to learn how to use the thing by next weekend) I'm ready. Was at a hair salon yesterday getting my diva work done -- told the manicurist about the project, she's getting soldiers today (not joining the list though); the owner of the salon was excited and suggested we all call our local newspapers to cover the action. And I saw my first "Impeach Bush" bumper sticker yesterday.